I've always admired Diana's arty eclectic style. She likes to play with shape, drape and volume and she has a great balance of pretty and edgy that I aspire to. And she is such a talented knitter--she always has great hand knit scarfs and sweaters. She and I both wear the Halogen floral sweater from NAS a lot so I thought that would be an obvious choice for the twin item. She wore it with plaid shorts recently so I paired it with my blue and green plaid skinny jeans. She also wore it with a voluminous bubble skirt and purple coat, so I used my purple cocoon coat to match her coat and to represent the volume and avant garde of the skirt. She was my YLF Secret Santa last year and gave me a fabulous burgundy necklace that she hand crocheted. Thanks so much Diana--it's beautiful! It was a perfect match for the floral sweater. I wore the black moto booties and studded black satchel to represent her edgy side, and the scarf and beanie to represent her knitting handiwork (sorry, could not replicate the handmade items!). Bundled up (#1) to pretend it's as chilly here as in the East Coast (#12) (ha! ), and tried to stand in a more relaxed pose like she does. Still did some matchy matchy with the plaid scarf and jeans. Hallo marshmallow peeps!!! Welcome to another episode of Native Wear Arbeitskleidung--this time with a secret guest host! Rachylou is off walking her Lilypup, so I thought I'd sneak into her garage and take over her cable show while she's away! Schwing!!! I don't think she'll mind tho. Here we can discuss the latest Straßenmode for Bay Area Natives who are too hip to call themselves hipsters, live in Berkeley and work in the City, shop at Jeremy's instead of Anthro, and still dress and party like it's 1999. Prairie never goes out of style--ditsy florals FTW! Too bad I lost my Blossom hat, but I do have a crochet beanie. Yes of course I'm wearing a puffer. It's FREEZING--only 50 degrees! I bet Rachy and Lilypup are wearing their puffers too. I think Rachy's the only Bay Area Native who has more puffers than I do! My take on matchy clashy--repeat the colors and shapes to make it look not completely random. Mustard and teal and cognac/orange on the belt and purse and knit scarf. Cream flowers on the dress and purse to match the cream puffer (say ruffle puffer five times fast). Chevron necklace with chevron/herringbone tights and diamond shapes on the dress and the belt. A little worried it was TMGO for work, but I got plenty of compliments today, so I must be on the right track. Found this inspiration photo of Rachy with a similar plum print prairie dress (7)--I don't have a fabulous fur stole, but I do have faux fur trim on the puffer hood. What do you think--did I get Quirky Waif? Oh yeah--bonus Office Bathroom shot just like Rachy! Speaking of quirky, let me show you my new apron--Totoro! For Christmas I got a Totoro pillow for the kids, but they were fighting over it so much I had to buy two more, one for each kid, but now DH and I want one too, so I am going to have to get a couple more so we can have five! Uh oh, I hear the door rattling. That's all we have time for today. Thanks for watching this episode of Lil' Puffers on the Prairie. Until next time, it's Waif World, Waif World, Party Time, Excellent! Party on Fabbers! ASOS Vero Moda plum print dress, Betsey Johnson cream ruffle puffer, Nordstrom infinity scarf, Fossil velvet floral satchel, Anthro mustard/teal belt, Madewell chevron necklace, Gap herringbone tights, Mia Nanette brown lace up ankle booties. In my first chameleon thread, I asked for suggestions for who I should try to copy and annabelle asked me to copy Torontogirl's all neutral outfit with leopard scarf. I have to be honest, at first I wasn't sure I could do this one and make it look like me. I hardly ever wear scarves--I'm always worried they will get in the way at work when I'm bending over patients, or become a choking hazard (to me!) when I'm with my toddler. Plus my clothes tend to be patterned, which would compete for attention with scarves. I do have several scarves (about 10) but they've been languishing in my closet. And I don't usually wear outfits with all plain neutrals. I've usually been doing bright colors, or more lately, dark black, but always some type of pattern. I did some more reading on TG's style. Sounds like we both have daughters of similar age who have strong opinions on fashion! I also noted how she did Project 333 and limited her wardrobe to 33 items for 3 months. Her Pinterest board of her 333 wardrobe looks like a beautiful California Closets ad! While I would love to do the Zen minimalist wardrobe, capsule dressing and neutrals would never work for me. I'm too addicted to prints and colors! However, I thought it would be the perfect challenge for trying a new approach. I don't usually dress in neutrals and let the accessories do the talking. (Usually my outfit and the accessories are competing for attention, LOL!) It was a fun challenge, and I have to say I'm pleased with the results. Thanks TG for giving me another approach to outfit creation, and for rescuing my orphan scarf! And thanks Annabelle for suggesting the copycat! 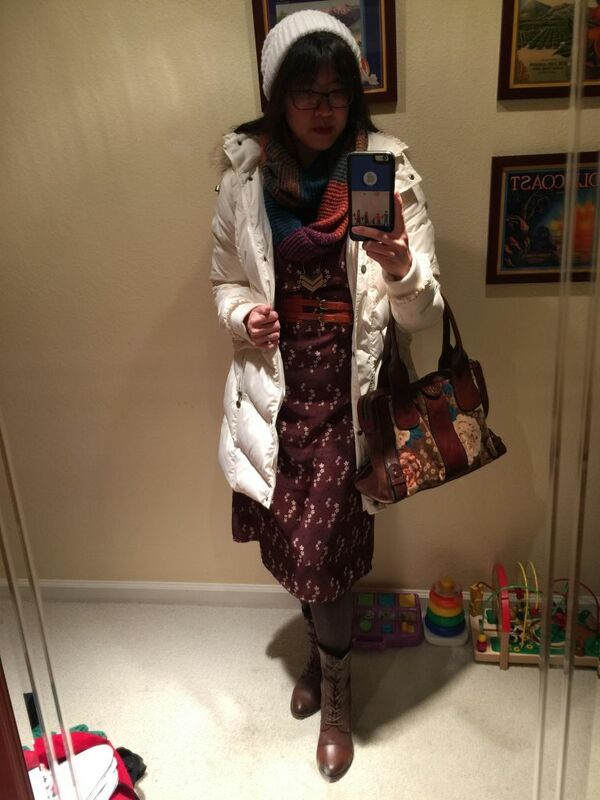 I did two different outfits, one casual that would be perfect for MOTG since TG is a SAHM. 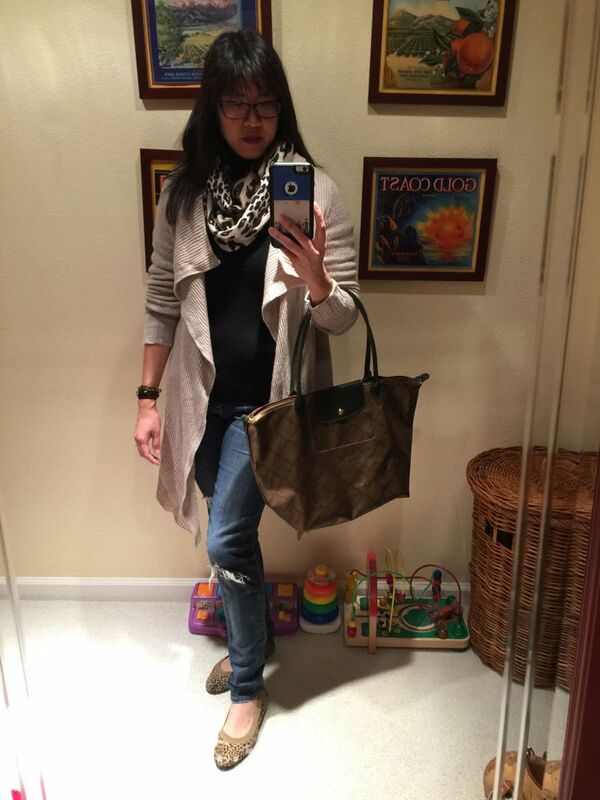 I picked a neutral oatmeal cardigan and paired it with a black turtleneck and the leopard scarf, with distressed jeans and leopard ballet flats. With a Longchamp tote just like TG carries--perfect for carrying things around as a MOTG. I included my signature matchy matchy with triple animal print with the scarf, shoes and bracelet. Since I was going to work today, I also did another version, swapping out for a tweed pencil skirt and cheetah pumps. I also had to learn how to tie a scarf--I tied it in a more casual infinity style for MOTG and a long double twist for work. At first I was going to do the cream and black tipped peacoat and add the dotty purse to echo the black buttons (and to add one more animal print with the snakeskin purse), but I decided that was way TMGO and switched to the cognac leather jacket and the bronze tote. I'm happy with how it came out. I haven't done all neutrals or leopard or brown in a long while--nice to change things up! For the second day of my Style Chameleon Twin Challenge I was inspired by Rae and her Urban Warrior Mermaid persona. I've always felt a connection with Rae and her tough yet feminine UWP style. I love how she mixes the toughness of the UWP with the flowy organic feminine side, and the way she balances yin and yang with her girly tomboy looks. I just had to have the Michael Michael Kors agate print dress after seeing her wear it a couple of years ago. I also had the privilege of meeting her at the YLF OC swap meetup and she is just as warm, thoughtful and wonderful in person as she is on the forum! 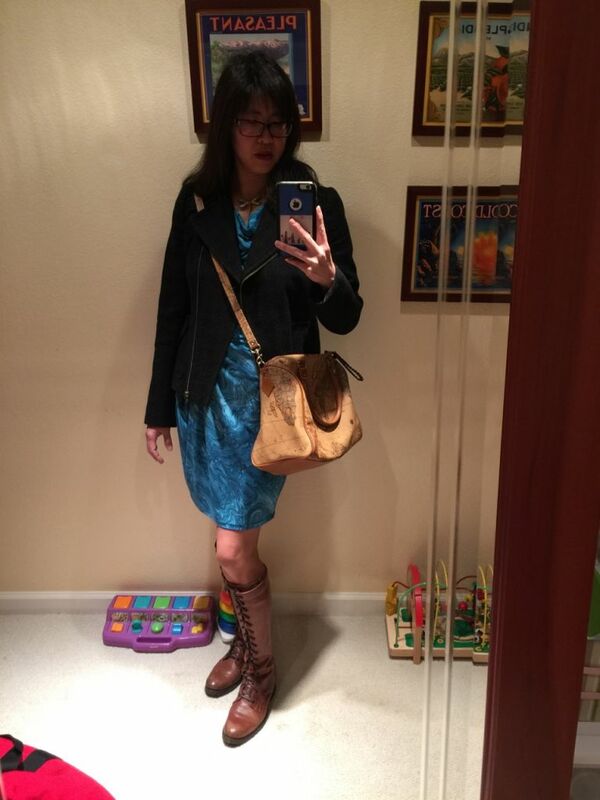 For my challenge, I chose a tough/organic combination of tall lace up boots and tweedy asymmetric zip moto jacket over draped flowy water print dress, but lo and behold I found out she already did this combo in her original post two years ago (6)! I guess it's completely fitting then that I chose this outfit combination because we really are twins! I have to admit I miss being long black hair twins with her too, but I do think her short 'do completely suits her. She has also said she is inspired by nature, so I chose the dragonfly pendant and cuff. Finally, I chose the map bag because it is really special to me, since Rae gave it to me. I had always drooled over that bag every time she posted it, thinking that I wish I could find a bag like that. When she generously gave it away in the style exchange, I was lucky enough to be the first one to pounce, and I have been using it ever since! It reminds me of her every time I use it. Thanks so much Rae! I also consider the dress my "Rae" dress because I think of her when I wear it. Rae and I have actually already done a twin day with this dress in the past--check out all the different toppers we tried. The orange blazer was the winner, with our stripey and dotty fraternal twin purses and our matching kitties! Michael Michael Kors agate dress, Halogen tweed moto jacket, Alexis Bittar dragonfly pendant, Tildon dragonfly cuff, Karl Lagerfeld watch, Frye Melissa lace-up cognac boots, map bag c/o Rae. I didn't post any outfits all of December, partly because I was so busy with work and family and partly because I was feeling uninspired with my wardrobe. I was wearing the same things over and over (hello Eileen Fisher poncho!) because I gained about 10 lb and some of my clothes were no longer fitting, and I just didn't have the energy to think about what to wear. Dressing seemed like a chore. Well, it's a new year and one of my goals is to hug my closet and start having fun with fashion again! So I loved Angie's idea of setting a style challenge for yourself to beat the January blues. But because my fashion motto is "anything worth doing is worth doing to excess", I want to make it a real hard challenge! Nothing easy like "wear dresses for a whole week" (I could do that for a whole month in my sleep!). Something that will inspire me to be creative and look at my wardrobe in a new light. Here is my challenge to myself. I am going to be a style chameleon and each day "become" a different YLF member! I love doing dress-up and themed outfits and multiple style personas, so this will be right up my alley! 1. Twinnie item: I will use one item that I and the YLF member both own (or if not an exact item, something that is similar to something they own). 2. The outfit should look like the YLF member's style. 3. The outfit should look like my style too. 4. I have to actually wear the outfit IRL (so it has to work for work or MOTG). 5. I have to shop my closet for all of these. 6. Bonus points if I combine items in new ways or rescue closet orphans. So far I have about 7 different outfits planned for different YLF members. If you share an item with me or would love to see me copy someone, feel free to chime in--I'm open to suggestions! (And if you can post a link to the WIW of you or the Fabber in the item, that would be super helpful!). For Day 1 I thought I'd kick it off with the hardest but most fun challenge. Annagybe. She is fearless and fun. Whimsical and whackadoodle. She knows so much about fashion and designers and translates avant garde and runway into real life in masterful ways. She has an inimitable sense of style, but I'm going to try to copy her anyways. I've really missed seeing her around here (I still follow her on Facebook) and was so excited to see her posting here again--I really hope she'll start posting her outfits again! Since I don't own the same items as her (except maybe the H&M floral pants! ), I thought I'd use the Piers Atkinson bitten cherry headpiece that she wore for her last WIW post as the twinnie item (4). 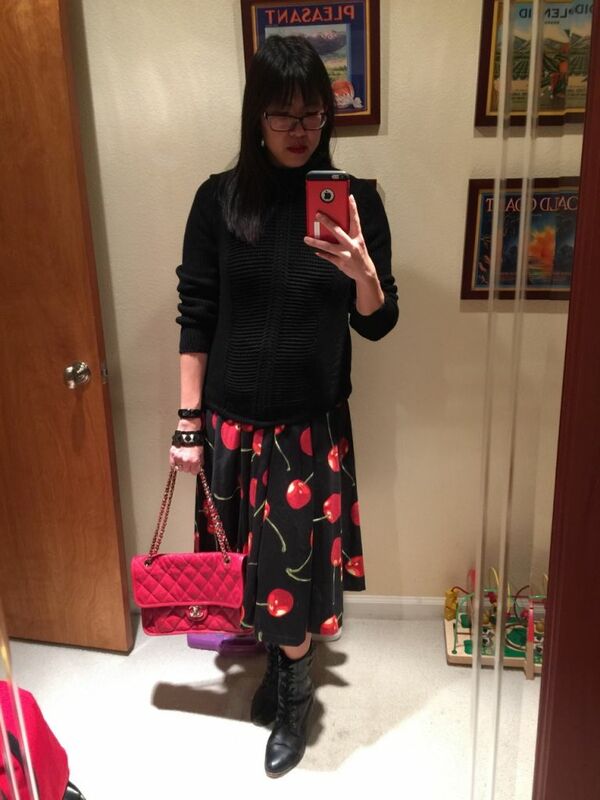 I have a cherry print dress that I bought off eBay a few years ago (I was trying to find something to wear for a Wild West office holiday party, but the dress turned out to be more rockabilly than saloon girl). I've only worn it once or twice because it's a strapless halter and very girly looking with red ribbon ties, so not very work friendly. I think I last wore it a couple years ago for DD's 5th birthday party (5). It's a real closet orphan. I even brought it to the consignment store a year or so ago, but when I saw it hanging in the store window I had second thoughts and asked for it back. I just couldn't part with it! Anna's red and black edgy cherry outfit inspired me to try again. I turned the dress into a skirt and added a black Helmut Lang sweater (it's kind of see through so I have a tank underneath), black heeled ankle boots like she has on, pyramid stud watch and bracelet inspired by her avatar, and Chanel purse because she likes to combine high and low. And of course her signature red pucker! Thanks for looking and commenting! I'm super excited about this challenge! It feels like I dropped off the face of the earth--sorry I haven't been posting much lately. 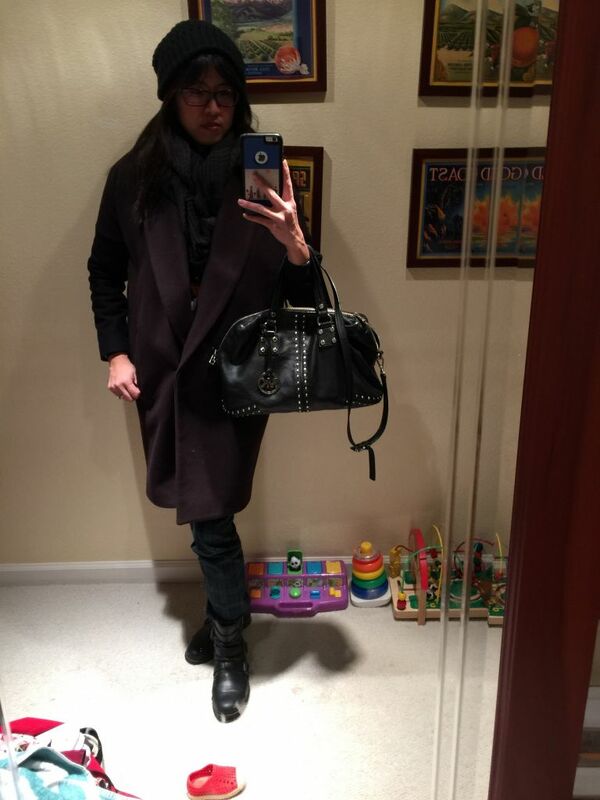 Things have been so busy with work and the three kids that I haven't had much time to devote to fashion recently--I realize now that I didn't even post a single outfit at all in December! At least I had the rest of the year to choose from--these are the outfits that seem the most me this year. What's new for me this year compared to 2013? At the end of last year I said that one of my style goals was to explore my Polished Ladylike Edgy. My outfits this year have definitely gotten edgier--more black and grey, more leather, spiky bracelets and studded heels and sandals. It's been interesting to explore how to incorporate edginess into both work and MOTG outfits, both arenas where edginess might not seem appropriate or expected. I also felt a dichotomy between my typical Kate Spade girly brightly colored/patterned ALGO persona and my darker neutral/black edgy shadow persona. So it was fitting that my two favorite purchases this year were my new watches--a silver Burberry with a blue dial for my primary "ladylike" persona and a black pyramid stud Karl Lagerfeld for my "edgy" persona, bought on the same day! Although I have to say the lines have blurred and it feels like my shadow persona is becoming my primary persona! I also noticed that I gravitated toward a lot more casual outfits. Almost half of this year's outfits I selected are casual, even including workout gear and sneakers! Many of my most worn purchases this year have been casual and/or comfort items, like the Barefoot Dreams "blardigan", the Rag & Bone pajama jeans (I wear them so much I bought two pairs as well as the shorts version! ), the Munro Abby low-heeled sandals and Munro Aries Birk alternative sandals, and the Eileen Fisher poncho (thanks Angie for the recommendation!). What's stayed the same? 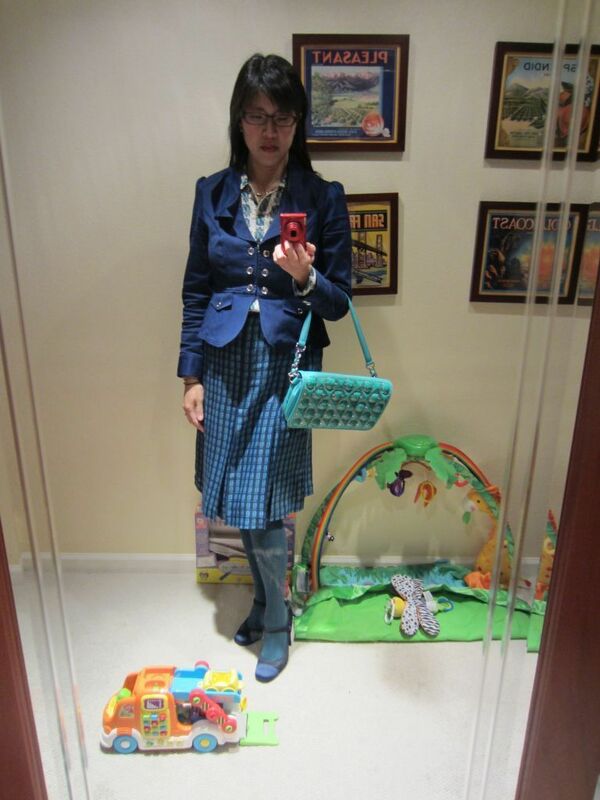 My love of matchy matchy and repeating a theme throughout the outfit (like dragonfly necklace, beetle blouse and dragonfly shoes in 1, or polka dot skirt and iPhone case and dot necklaced to match the typewriter buttons in 3, or striped bag to match the striped skirt in 21 for my SSIF outfit!). And I love to transition outfits from work to MOTG (3/4, 8/9, 11/12, 16/17. 18/19). For 2015 I think I will be looking to simplify and make dressing easier, so I'm going to try to figure out the combinations that make me happiest and repeat those outfits more. I'd like to organize my closet and get rid of some of the clothes I don't wear much anymore. I'd like to play around with my closet and see if I can unearth some forgotten treasures instead of buying much this year. I'd also like to focus on upgrading my loungewear and finding a balance between style and comfort for my casual wear. Hope 2015 is stylish and as fabulous as you all are! Thanks Angie and my YLF sisters for making my life happy and special!